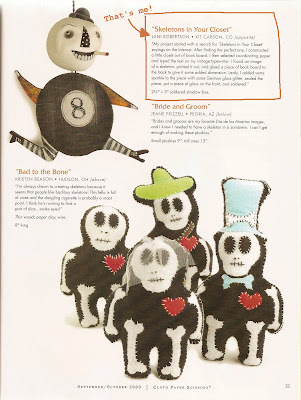 Objects Of Affection: My Art Was Published in Cloth Paper Scissors! My Art Was Published in Cloth Paper Scissors! I have been on cloud 9. The other day I got my favorite magazine, Cloth Paper Scissors, in the mail and discovered that my soldered shadow box had been included on the cover page (pg. 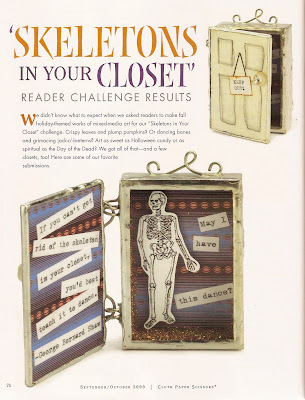 74) of "Skeletons In Your Closet" Readers Challenge. I am so honored to be included among the many very talented artists who make up this wonderful magazine, and I hope that I will be included in many more issues to come! Girl - that is so awesome!! Congrats - I'll have to go out and pick up an issue before they're gone. Yay :)! Well deserved.